Effective purchasing management allows brands to advance deadlines and be more agile than their competitors. Considering that many brands in the fashion sector, mainly SMEs, manufacture on demand to achieve this greater efficiency, three things are fundamentally needed: to quickly calculate the needs of materials according to existing orders, to automate those orders and to be able to make purchase projections before collecting every order. A brand that advances the purchase of the necessary materials to manufacture a collection can begin before picking up their orders, manufacturing them and finally delivering them to stores, thus providing better service to their customers. On the other hand, the tendency to outsource the manufacturing requires greater agility in the purchasing phase, since the cost savings occur in exchange for adapting to the terms and requirements of the manufacturer. In addition, purchases involve other tasks of an administrative, but no less important, nature; such as the management of budgets and shipping lists, the tracking of orders, quality control, receipt of invoices, accounting, payments, and more. 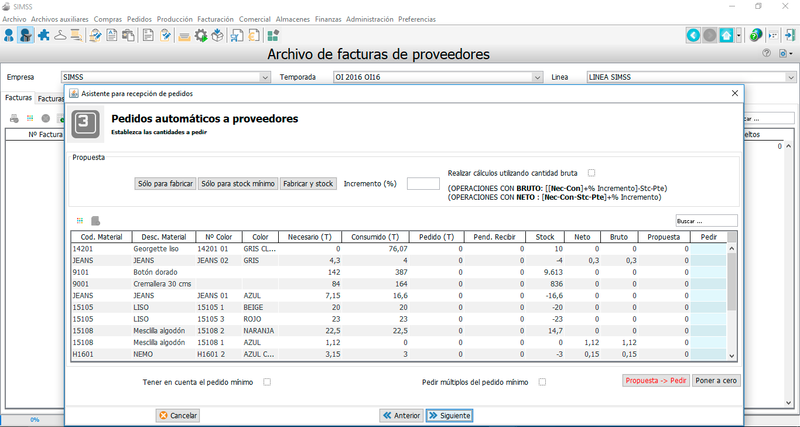 Based on the orders collected by the sales representatives, the solution automatically calculates what materials and in what quantities that is necessary to buy to satisfy the current demand, saving time and avoiding shortages in material stock. The brand can advance its purchases by a month thanks to the use of a mathematical algorithm that allows it to estimate its sales after having collected only half of its orders for a collection. These projections can have differencing levels of conservatism depending on the brand’s criteria. The system detects when it is necessary to buy materials according to the conditions previously specified by the brand, and issues a purchase order for materials automatically. · ERP for companies in the fashion sector: budgets, delivery notes, billing or accounting, among others.